The turbulence and uncertainty that has confronted investors during the past 10 years has given rise to shift towards passive investing. In response, a new range of alternative and, increasingly, customised index approaches has been created to help investors address their specific concerns. 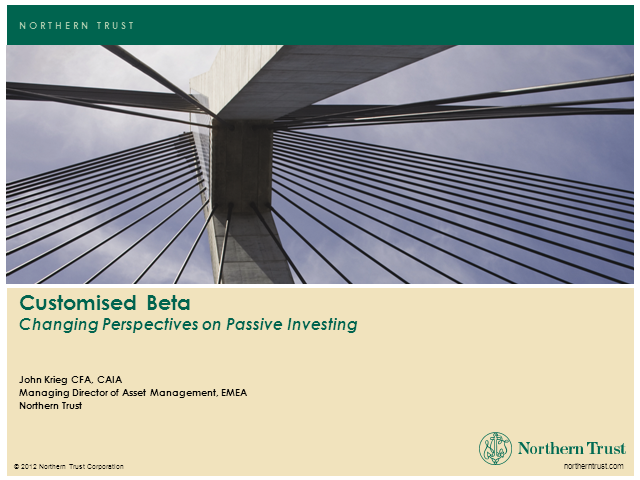 The ability to tailor an index to provide specific exposures or risk/reward ratios, then passively manage to this index raises questions about the distinction between alpha and beta. - Opportunities for removing unwanted biases and inefficiencies in existing indexes. • ETFs thrive in volatility: European institutions in 2018 were repositioning their portfolios for a turbulent investment environment featuring the prospect of European Central Bank (ECB) rate hikes and a host of geopolitical risks. • Index revolution: European institutions in search of low-cost beta continued shifting assets from active management to index strategies last year. • ESG is key: European institutions are integrating Environmental, Social and Governance (ESG) standards into their investment process, and many of these investors are using ETFs as their vehicle of choice for ESG exposures. These trends helped fuel robust growth in ETF allocations among the institutional funds, asset managers, insurance companies, and discretionary wealth managers participating in the 2018 study. Join subject matter experts from index provider FTSE Russell and ETF issuer iShares for this webcast analysing the results from this latest Greenwich report and discuss ETFs’ benefits and future growth potential with European institutions. Protecting the environment is now a priority for consumers, companies and governments. Their converging interests, driven by increased global awareness, technological advances and health concerns, are underpinning a global drive to safeguard the world’s natural resources. The private sector is rising to the challenge with the most proactive companies integrating environmental policies into their sales strategies and business models to generate new opportunities. We believe companies with products and services that maximise resource efficiency and help diminish pollution will offer long-term sustainable returns. In this webinar, Pictet Asset Management’s thematic investment managers explain the process they adopt to unlock the potential of environmental investments. They delve into why employing an investment screen that uses a rigorous planetary-boundaries framework and lifecycle analysis can not only safeguard the natural world but enhance investment return. Tune in to this webcast to hear LGIM's market experts talk about the growing £50bn Build to Rent (BTR) sector and why it’s part of the solution to the UK’s housing issues and investor requirements. • What is UK Build to Rent? • What does BTR deliver to an investment portfolio for both UK and non-UK investors? • How will the BTR sector evolve? Factor investing offers a big promise. By identifying the persistent drivers of long-term returns in their portfolios, investors can understand which risks they are exposed to, and make explicit choices about these exposures. When it comes to information about factors, providers offer analytic toolkits to identify the factor exposures of an investor's portfolio. However, these analytic tools do not employ academically grounded factors and their factor finding process maximises the risk of ending up with false factors. These non-standard factors also lead to mismeasurement of exposures and may capture exposure to redundant factors. In the end, analytic tools for investors do not deliver on the promise of factor investing and they also lack transparency. This webinar will contrast factor definitions used in analytic tools offered to investors and compare them with the standard academic factors. We will also outline why the methodologies used in popular tools pose a high risk of ending up with irrelevant factors. When faced with market volatility, many institutional investors typically allocate a percentage of their portfolio to cash. Sitting, waiting, for the waters to calm before they dip their ‘investment toe’ back in. However, non-participation presents a timing risk and may mean ‘missing the boat’ when markets calm and climb. How can investors reduce overall portfolio risk while remaining invested? How can index-based investment approaches help investors meet their defensive objectives? In this webinar Marlies van Boven, PhD, Managing Director Research & Analytics, FTSE Russell examines what popular indexed-based strategies can do to help limit the impact of portfolio volatility and mitigate risk. • Volatility – what are the key drivers behind the current market volatility? Since 2009, ETF assets have increased from c.$1trn to above $4trn today*. As AUM has increased, so too has the volume traded over exchanges, which has the direct impact of reducing transaction costs versus trading in the primary markets. This changing landscape requires a more holistic view of costs. In this webinar, we focus on ETFs and when and why it maybe more cost efficient to use an ETF instead of an alternative wrapper. We will look at the Total Cost of Ownership (TCO) framework and how it can help drive cost efficiencies for your Pension Fund, for both ETFs and IMFs. It also enables you to evaluate the most cost-efficient vehicle and gives you a better reflection of true costs. · What are the cost benefits of ETFs? · How will it fit within our current pension fund portfolio? · What is the Total Cost Ownership (TCO) framework? · How does TCO differ to the traditional cost analysis model for mutual funds? · Should I consider ETFs as a key investment strategy for our pension fund? · ETFs have been on the rise for the last few decades, will the trend continue? · What is the key strategy to achieving a strong return and cost-efficiencies? As institutional investors /pension schemes boost their exposure to alternative assets at transformational levels, they are exploring a variety of ways to access the investments. An evolving approach is to venture beyond the investor role by entering the realm of the asset manager and establishing their own investment vehicles. This can offer advantages such as full alignment to their requirements and greater control. Yet it also requires a high level of in-house expertise and operational considerations. Easy monetary policies across the globe have unleashed a troop of 800-pound gorillas to harass capital markets, and in doing so, have created unintended risks—and significant opportunities. Get insights on this and three other compounding issues that have heightened concerns of a market disruption, and learn how to navigate this environment and pursue resulting opportunities. In the current low-rate environment, the search for yield has led investors to alternative fixed income categories. Besides investments like mortgage loans and asset-backed securities, infrastructure debt offers institutional investors various advantages. Being a less liquid investment, investors in infrastructure debt receive an attractive illiquidity premium. On top of that, this asset class offers diversification benefits within a fixed income strategy, historically low default rates, high recovery rates and low capital charges under Solvency II. At present, more than half of all infrastructure projects relate to the renewable energy transition. Infrastructure debt is about assets that provide essential public services such as transport, energy, healthcare, utilities and telecom infrastructure. This also includes companies that tackle environmental problems, e.g. water treatment and minimizing energy wastage. In the long term, these assets generate predictable and stable cash flows and contribute to a more sustainable world. René Kassis, Managing Director, Head of Private Debt at La Banque Postale Asset Management will tell you more about this. The interest in growing Real Asset exposures in portfolios has boomed in recent years. But with an asset class that encompasses a range of Real Estate and Infrastructure sectors, and different shades of debt and equity, investors are faced with many options. Tune in to this webcast to hear LGIM's market experts Lorna Brown, Head of Real Estate Debt, Rob Martin, Real Assets Research Director and Tom Sumpster, Head of Infrastructure Finance talk about the different roles the asset class can play in meeting investors’ objectives. Factors have historically been identified as critical drivers of portfolio risk and return and can now be used to better inform the investment process and provide insight into market performance. Join our webcast to learn about MSCI’s latest factor research and how it can be applied to understanding recent market events. We will also examine how multi-factor strategies can provide core portfolio diversification. Please join us for a discussion on the underlying characteristics and risk/return profile of a public/private real assets portfolio along with an analysis of the “illiquidity premium” attributed to private funds. Real Asset financing is becoming increasingly popular. This is not surprising given the diversification benefits they bring and the sustainable, inflation-beating investment returns they can deliver. Tune in to this webcast to hear Pauline Fiastre, Senior Portfolio Manager, Infrastructure Debt and Philippe Deloffre, Head of Real Estate Debt at BNP Paribas Asset Management, talk about why Real Assets are an important component of an investment portfolio. Trustees and pension fund executives increasingly need to understand the full cost of managing their investments to enable them to determine if they are receiving value for money. Yet many find it difficult to obtain the information required to complete this analysis. As pension investment costs and charges come increasingly to the fore of industry debate, this webcast will provide ideas for those seeking to gain deeper insight into schemes’ investment costs and charges. Retirement is one of the biggest public policy challenges of this century. The global shift to defined contribution pensions reduces government and employer liabilities but can it deliver good outcomes for individuals carrying the investment risk? Towards a new pensions settlement the international experience vols. I & II is a research project in which subject expert academics examine transitions to funded DC pensions in global comparative context. Gregg McClymont & Leandros Kalisperas will discuss the emerging dos and don’ts of DC design based on evidence from across Europe, Asia, and the Americas in this webcast. A webcast for all those interested in understanding the international drivers for success in pension design in the 2020s and beyond. In this webinar, we will explore whether dynamic factor allocation can create value for investors. We will examine whether factor-based tactical allocation approaches are easy to implement and see how to account for cyclicality and conditionality of betas and premia in the context of factor investing solutions. We will present a case study of dynamic market beta adjustment and dynamic premia diversification of solutions to improve the conditionality of the performance of multi-factor strategies. Factor Investing is transforming the way investors construct and manage portfolios. Join our webcast to learn about the evolution from Style Investing to Factor Investing taking place today. MSCI’s latest Factor innovation, MSCI FaCS and Factor Box provide the framework and standard for evaluating, implementing and reporting Factor allocations. As the bull market enters its 10th year and valuations continue climbing across most market sectors, investors naturally begin to question where future growth may come from. Artisan Partners Growth Team is focused on identifying high-quality franchises that are on the cusp of or in the early stages of compelling profit cycles—wherever they may occur. As the market cycle matures, the team’s process becomes even more critical to identifying opportunities for accelerating profit growth. The Growth team’s Jason White, lead portfolio manager for the recently launched Artisan Global Discovery Strategy, will discuss where the team is finding compelling opportunities, even against the backdrop of a maturing bull market. Andrew Marks is a managing director of Artisan Partners UK and head of Europe, Middle East and Africa (EMEA) Distribution. As sustainable investing moves into the mainstream of institutional investing many investors may be unsure why this once niche strand of portfolio construction has risen so rapidly in the rankings of investor consideration. Is it driven by values, global policy, or is it really about a pure investment rationale; enhancing returns and minimising risk? Or a mixture of all three? Join Dan Carson, Head of Green Solutions at FTSE Russell as he seeks to elaborate on some of the issues and drivers that have led to the increased popularity of sustainable investing; explaining why green taxonomies are important and how FTSE Russell’s Green Revenues data model can help asset owners identify the companies that are engaged in the global transition to a green economy. Dan will go on to demonstrate how Green Revenues data is used within index construction and how asset owners have successfully used sustainability data and smart beta to build index solutions that eloquently combine risk premia with varying degrees of sustainable preference or parameters. This webcast channel is for pension funds and other institutional investment professionals in Europe, the USA and Asia. It is particularly relevant for pension fund executives, trustees, consultants and investment managers. IPE will be bringing its community live interviews with leading figures in the market, hosting roundtable discussions on specific topics such as asset allocation and also sharing latest thought-leadership from investment experts.